Everyone is used to piracy on the high seas. Somalian pirates on the high seas are renown. Piracy at high altitude? Perhaps we have just seen the first event in a new era. Sooner or later it was bound to happen and maybe this attempt wasn’t successful – until there is a demand issued or wreckage is found, we won’t know. 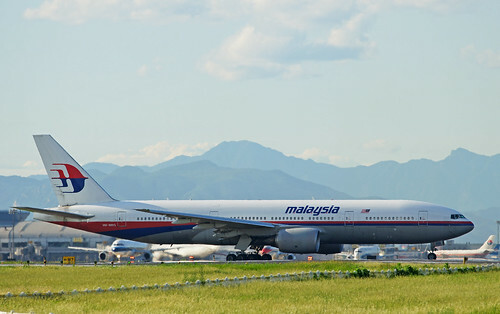 In a press conference held on Saturday afternoon, Mr Razak said that the plane was steered in a westerly direction. “These moments are consistent deliberation action from someone on the plane,” he said. 8 am? This plane either ran out of fuel and crashed into the ocean (clearly not the intent) or it landed somewhere and powered down. Commercial aviation is almost a commercial anomaly in that it seems these days most airlines are either heavily subsidised by their “home” country or running at a loss. Anyone heard of the Qantas financial difficulties? Yes, I thought so. Really, airlines are not so commercial. But the world needs to fly. Airlines code share these days. I used to work for Australian Airlines before Qantas took us over. Back then code sharing didn’t exist. It exists today because of the costs of running an airline. Before code sharing, you could always find a bank of four empty seats on the red-eye from Los Angeles and spread out. Now? Not a hope! I believe, despite what animosity may exist between various nations on this planet at this moment, none of them want the airline industry to come to a grinding halt. They will all co-operate to solve the mystery of MH370 because it is in the interests of every single nation to be able to fly. This is why so many countries are involved in the search. Not one country wants the next event to be one of their own. Perhaps the best proof of this is countries now sharing what is considered confidential information. As sad as I am to say this, I doubt this sharing is driven only by concern for the 239 people on board. The primary driver is no-one wants to be next. We all know pirates only pirate to get something. Money, riches, perhaps science. In this day of electronic financial transactions, money isn’t a piracy reward. Riches? Who travels with valuable jewelry? Resale value of a stolen plane? Not so much, one would think. Science? Well, in this particular case, science does appear to be an option due to the twenty Freescale employees on the flight. The company is a global one that is headquartered in Austin, Texas and has operations in more than 20 countries. Its technologies were used in the U.S. mission to land a man on the moon as well as the first two-way mobile radio that had a power supply and receiver for cars. The company creates technology that is used in a range of products, such as eReaders and location tracking in smart mobile devices. Interesting, indeed. If these employees were the target, surely this goes beyond simple piracy and moves more into the realm of industrial or international espionage? Again, ALL countries need to be able to fly employees around the world, so all of them have a vested interest in ensuring this is a onetime event. Even the baddies don’t want to be the victims. To quote The Finnigans (@Thefinnigans), “It’s the James Bond option”. Who was the pilot that diverted the plane and, according to the latest reports, took the plane to an altitude not certified for? I find this interesting. Either the pilot knew that although not certified at that altitude, the plane would cope, OR this was the potentially fatal decision that lead to preemptive fuel consumption or structural damage preventing the plane landing as planned. If the twenty Freescale employees were the objective, who wanted them and why? Two days ago I wrote expressing my doubts about what people know, what we were being told and what had actually happened. I also asked, what have we learnt? What have we learnt? Hi-jacking, piracy, espionage – whatever name you apply, the lives of 239 people who innocently boarded a commercial flight are either at risk or have already been lost. I don’t think this is terrorism in the typical sense – there is something else at work here. Even if you do throw terrorism into the mix, the end result is the same. Let’s ask some simple questions. I’m big on reality and the KISS principle. So you steal a plane with 239 people on board (minus yourself and accomplices). Do you want the plane, or the people? I’m guessing if the plane itself was the requirement, there would be ways to steal an empty plane. So I am left with the presumption the people were the requirement. Two thirds were Chinese and I don’t see China as a nation who would pay a ransom, although I’m open to being proven wrong. Malaysia is not the richest nation on earth, so is Malaysia a viable financial target? See what I mean? Not making a lot of sense, is it? I come back to the knowledge of the Freescale employees. Hey, I hope I am wrong, but I am trying to see what could be gained from this “abduction”. MAYBE there is someone else on the flight we do not know about yet that is of far greater value, possible political value. We don’t yet know. In my earlier article I asked are we being told the truth. Are we? Even now? The politics of this are interesting. If a country doesn’t help, it may seem they are complicit. Overriding that: none of them wants to be next. They will all co-operate to find MH370. It is a matter of self-protection. Edit March 16: It seems this morning increasing attention is being paid to the possibility of a link to Uighur separatists. Originally this was discounted as being merely an opportunistic claim. Will this prove to be true, or not? Was vital information overlooked? It gets more mystifying by the day. It’s a mystery story for a book and a movie. Definitely a movie. I reckon the script is already in draft form!